• Concordia's men claimed their first Great Northwest Athletic Conference outdoor title at Western Oregon on Saturday. The Cavaliers scored 138 points to out-duel runner-up Western Washington (127). Cavs senior Carlos Ortiz won both sprints (10.55 100, 21.50 200), and freshman Jacob Slate captured the hammer throw (196-10), with teammate Jakob Chamberlin second (186-8). The Cavaliers also won the GNAC men's indoor track and field team title in February. The Concordia women tied Central Washington for second with 121 points apiece. 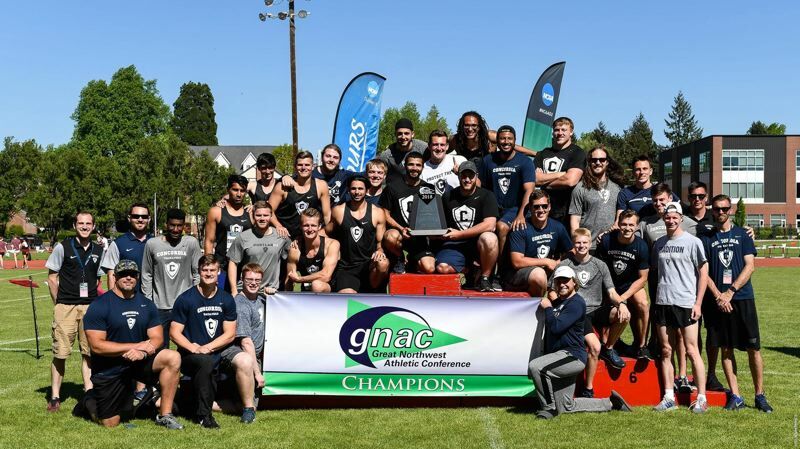 Seattle Pacific netted 154 points for its ninth consecutive championship. Christina MacDonald of Concordia shared Field Athlete of the Meet honors with SPU's Renick Meyer after setting a meet record of 195 feet, 7 inches in the hammer on Saturday. MacDonald also won the shot put on Friday with a throw of 48-4 1/2. • The Oregon men scored 43 points at Stanford to end the day in second place. The host Cardinal grabbed the lead with 48 points. UO junior Damarcus Simpson finished first in the long jump for the second time in his career, going 27-4. Teammate Tristan James was second at 25-7 1/4. In the women's meet, Oregon notched 22 points and were tied for seventh place going into Sunday's finals. Oregon State was 10th with 16 points. Stanford leads with 71 points, but USC is favored after getting 44 points for second. • University of Portland junior Taryn Rawlings set a school record in the 1,500 as she finished second in 4:14.50 at the Portland Twilight at Lewis & Clark. The old mark of 4:16.14 belonged to Nicole Karr. Juniors Noah Schutte (3,000 steeplechase, 8:50.69) and Reuben Kiprono (10,000, 29:57.76) won their heats for the Pilots. • The Ducks won their NCAA tournament opener for the thrid year in a row, blanking No. 27 Dartmouth at Fort Worth, Texas. Ty Gentry's 6-4, 6-2 victory at No. 4 singles gave UO its clinching point. Oregon (18-9) started off by claiming the doubles point. Other points came from Akihiro Tanaka at No. 3 singles and Thomas Laurent in the No. 1 spot (6-3, 6-3). The Ducks will face Utah State or TCU at 11 a.m. Sunday. • The Ducks fell to the No. 3 overall-seeded Blue Devils in the second round of the NCAA tournament at Durham, North Carolina. Oregon finished with a 16-10 record this season. Duke improved to 25-3. Duke claimed the first two wins before the Ducks rallied to even the score at 2-2. The Blue Devils then turned away Oregon's late rally with a pair of victories in straight sets to advance to the third round.